I've posted a summary of our trip to Southern South America to http://www.yachana.org/marc/patagonia/. My next trip is to Nairobi, Kenya for the World Social Forum from January 20-25, 2007. Follow along at http://www.yachana.org/reports/wsf7/. 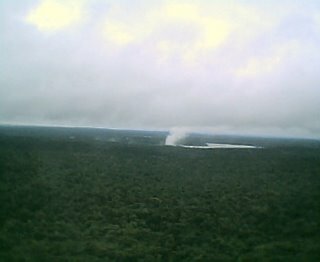 The Puerto Iguazu airport is right beside the falls, and the plume of mist from the Garganta del Diablo is visible from the cafeteria in the airport. As we take off we briefly glimpse a view of the falls before we disappear into the heavy cloud cover. On a clear, sunny day, the view from the plane must be remarkable. Last nite was the full moon. So, we went back out to Iguazu Falls for their special moonlit walk to the Garganta del Diablo. It had been rainy and cloudy during the day, so we thought that it would be called off. But at 8 pm the sky began to break so they decided to do the walk. Unfortunately, after a 25 minute train ride and 30 minute walk, by the time we arrived at the falls the moon was clouded over again. An hour later when we were back at the park entrance, the clouds had pulled back and we could see a brilliant full moon again. So much for the walk. To boot, the park sells the tour for 50 pesos and we made the mistake of buying the tour from an agency that resells them for 80 pesos. Ouch. This morning it is still raining, and time to get back on a plane to Buenos Aires and then to the States. Another long travel day, and the trip is pretty much over. We returned to Iguazu Falls for a second day and once again got wet, but this time from the rain instead of water from the falls. It was overcast, so I thought we could take a 6-kilometer trail through the forest to a smaller falls in a different part of the park while we waited for the weather to clear. When we arrived at the falls, it started to sprinkle and then rain harder. We splashed back along an increasingly muddy trail getting completely soaked. When we returned to the main part of the falls, it had largely stopped raining so we took the park’s train to the Garganta del Diablo (the devil’s throat). These are the largest falls in the park and are best viewed on a clear, sunny day. We had saved them for today because we thought it would be clearer and sunnier today. That was not to be. But even without the rainbows and butterflies, the falls are still impressive. The plummeting falls send up a large plume of spray that can be seen from quite a distance. Iguazu Falls was named a UNESCO world heritage site in 1984. 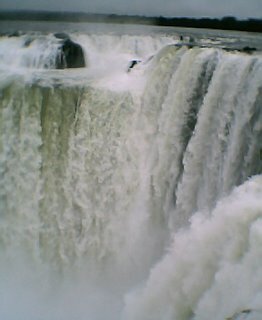 It is famous for being the location of the 1987 film The Mission which led a generation of Latin American historians to ask why Robert DeNiro insisted on going over the falls rather than around them. The falls lie on the border between Argentina and Brazil. 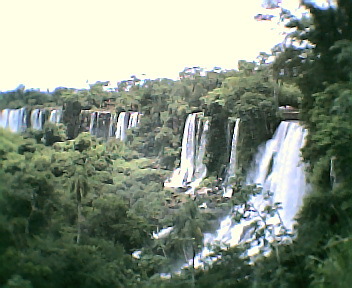 On the Argentine side we can see the falls up close, but apparently the Brazilian side provides more panoramic views. It appears that visa complications will keep us only on the Argentine side. Trails run through the park, with huge iguanas and racoon-like rodents called coatis scampering in front of us. Several commercial-type excursions run in the park, including running speed boats right up against the rocks directly under the falls where passengers and their cameras get completely soaked. (Yes, this reminds us of going white water rafting on Christmas day about 10 years ago in the Ecuadorian Amazon, and makes us wonder why do this to ourselves–if we want to kill ourselves we can just go to Ciudad del Este.) Fortunately Aereolinas Argentinas decided to deliver our luggage from Buenos Aires, so we came back to the hotel to dry clothes (and now suntan lotion). Tomorrow is a full moon. A special excursion is going tomorrow night to see the falls under the full moon, which is supposed to be particularly special. Humidity is high and temperatures are in the high 30s, which is of course enough to give me another heat migraine leading to barfing and other fun activities. But the falls are beautiful, and so the plan is to return for a full day tomorrow. The Triple Border is where Argentina, Brazil, and Paraguay meet. As at the other end of Argentina, there is an obelisk (“hito”) marking the border. Rather than walking across an imaginary line, however, here one has to cross a river to reach the neighboring country. Paraguay lies on the left (north) side of the Paraná river, with the tall buildings of Ciudad del Este in the distance. Brazil and Foz do Iguaçu are across the Iguazu river on the right (south) side of the Paraná. Below, a ferry boat makes the short run to Paraguay. A bit up the Iguazu, a bridge connects Argentina and Brazil. The Triple Border, and particular Ciudad del Este on the Paraguayan side, is considered to be the center of contraband traffic in South America. Grey and black market goods are readily available there. Travel agencies in Puerto Iguazu advertise shopping trips to Ciudad del Este. The area has a sizable Muslim population, and the United States government claims that there are terrorist training camps here. I have never seen nor heard of evidence of such activity. Puerto Iguazu and Foz do Iguaçu on the Argentine and Brazilian sides thrive on tourism, and seem to be much safer. I am so close to both Brazil and Paraguay but yet so far away. I have visas for both countries, but it is unclear whether they are still valid. In 2003, I acquired a visa for Brazil to attend the World Social Forum in Puerto Alegre, and in June I applied for a Paraguayan visa to attend the Triple Border Social Forum in Ciudad del Este. I’ve been to Brazil twice, but my trip to the Triple Border Social Forum fell through. The passport with those visas expires in May, and since many countries will not let a traveler enter if there are less than six months remaining I now have a new one. The old passport with the visas still has four months remaining until it expires, but it is now stamped “canceled.” Brazil maintains a reciprocal visa arrangement with other countries, which means that thanks to Condoleeza Rice’s xenophobic policies it is expensive and complicated for a U.S. citizen to enter Brazil. 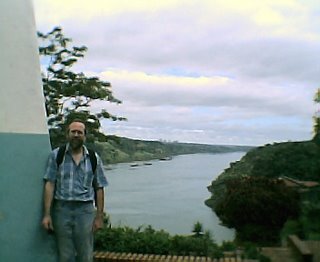 I wanted to skip across the border to Paraguay because it is one of 3 Latin American countries that I have not visited. Is it stupid to enter a country just for a stamp, particularly when it is relatively dangerous and everyone says that there is little to see there on a day trip? I hate traveling. More specifically, I hate flying. I like being different places and learning new things, but I’ve learned to hate the part that involves airports, airplanes, or flying. Delayed flights, cancelled flights, overbooked flights, changed schedules, missed connections–it’s all a real pain. Often there is little-to-no explanation, and we are all left wondering what is happening and whether we will arrive today or not. 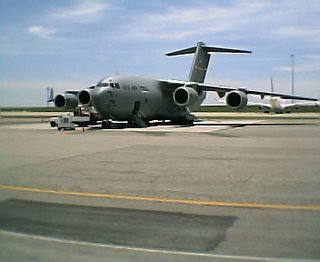 I pay money for specific schedules, and all too often what I buy bears little resemblance to what I actually fly. Trying to travel on holidays is doubly worse. In Montevideo, the tourist office told us that we could catch a bus out to the airport. We walked with our backpacks about 12 blocks to the bus terminal, only to find it closed and no buses running today. So much for tourist information. There were not many taxis either. The saving grace with a holiday, I guess, is that there is not much traffic either so once we found a taxi we arrived at the airport quicker (and cheaper) than we otherwise would have. The flight over the Rio de la Plata from Montevideo to Buenos Aires is a very short hop (about 30 minutes), but yet attendants try to serve us drinks and snacks. Then a slightly longer flight to Puerto Iguazu on the Triple Border with Paraguay and Brazil. Iguazu is the last stop on this trip. It’s hard to believe it is almost over already. It was originally to be an easy travel day–get up in the morning in Montevideo and by early afternoon we’d be settling in at Iguazu. But they canceled the morning flight, and sent us on an afternoon one instead. Then in Buenos Aires they put us on a plane, took us back off, and waiting several hours before putting us on another plane. When we arrived in Iguazu almost 10 hours after what was originally planned, we discovered our luggage was still in Buenos Aires. All in all, a long miserable travel day from hell.